Collecting objects such as antique light bulbs can encompass a broad range of bulb types. Because of the seemingly endless varieties of bulbs to collect, many collectors focus on certain types of bulbs or those manufactured before a certain date. One "flavor" that I enjoy collecting are early neon/argon glow lamps, both figural and non figural types. Collecting figural glow lamps has become increasingly popular in recent years so it seems fitting to dedicate some space here to them as well as other glow lamps that I find interesting. The following pages represent many of the glow lamps in my collection as well as some history I have been able to learn while collecting and researching them. Daniel McFarlan Moore developed a method of lighting in 1898 utilizing a complicated system of vacuum pumps, regulators, glass tubing, and dangerous high voltage electronics. Moore's gas discharge light system saw limited succes s in industrial and office environments but paved the way for the success of future discharge lamps that would become popular decades later, and still today. In 1920 Moore, working under General Electric, is credited with the invention of the neon glow lamp that we are all familiar with today. Glow lamps were successful for many reasons including their long life span and ruggedness. They were also economical to operate. 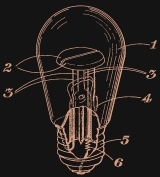 Glow lamps found many uses and were used for pilot lamps in machinery and appliances, night lights in the home, and voltage regulators in electronic circuits just to name a few. Specialized glow lamps such as the crater lamp were developed soon after Moore's initial invention to accommodate new technologies of the day including facsimile and television. In 1932 Philip J. Kayatt filed a patent for the first novelty neon glow lamp depicting a figure of a sailer. Neon lamps weren't anything new to Kayatt at this time. He had prior experience working for Radio Inventions, Inc. headed by the leadership of facsimile pioneer John VL Hogan. Kayatt had four patents for television glow lamps that were held by Radio Inventions, Inc. in the early 1930s. Kayatt also worked with Lee DeForest on a scanning disk television which utilized a neon lamp in the receiver. Having this experience in the newly emerging field of glow lamps probably led to Kayatt's desire to take the humble glow lamp to another level. It didn't take long to realize that the two electrodes in a common neon glow lamp could be bent or shaped into just about anything imaginable. It was also known that by introducing different gases into the bulb, different colors could be achieved when the electrodes were energized. Kayatt was an entrepreneur who built businesses around his inventions to market and sell his products. He also sold the rights to use his patents to other glow lamp manufacturers. Kayatt's first glow lamp company was the Solex Lights Corporation which was in operation from 1932 to 1935 and manufactured figural neon lamps. The International Glow Lamp Corp. (IGLC) and Canadian subsidiary IGLCanada was another early company tied to Kayatt. Birdseye Electric was formed in 1935 by the frozen food pioneer Clarence Birdseye. Birdseye produced figural neon glow lights after purchasing their machinery, tooling, dies, etc. from Solex which was out of business at this time. Birdseye manufactured glow lights under exclusive rights from Philip Kayatt. It appears that Aerolux came into existence during the late 1930s under the leadership of Philip Kayatt, probably after the time that Birdseye discontinued their glow lamp production. Many artistic design p atents were filed by Harry Zaun for glow lamp designs used by Aerolux. It is unclear what other relationship Harry Zaun had with the company beyond the artwork for certain lamp designs. Aerolux was quite successful and stayed in business for several decades. Aerolux produced hundreds of different glow lights and today their bulbs are probably the most recognized figural glow light. Aerolux bulbs make fun collectibles because of the large number of different bulbs that can be found: colorful flower bulbs, animals, insignias, religious symbols, comic characters, advertising, and more. The aforementioned companies were all based around the patents of Philip Kayatt. It is also important to understand that other American companies were producing figural glow lights at this time. General Electric's early Vapor Lamp division pro duced a small number of figural glow lights as well as a line of "alphabet" bulbs. These light bulbs contained single letters or numbers inside which glowed neon orange when energized and were available in both base-up and base-down versions. The alphabet bulbs could be arranged in a socket array to form words or addresses well suited for advertising purposes. It is rumored that GE's production of figural glow lights lasted only for a few years during the 1930s with production ending due to competition with Kayatt's companies. Amglo was another early company that formed in 1935. Amglo produced large neon indicator tubes and several very intricate and large glow lamps for the advertising market, probably on a prototype or "need-for" only basis since they are scarce today. Several early figural glow lights have emerged from Europe however their history is not documented here simply due to lack of definite information. Bases of early European bulbs have been seen with the marks: Philips (Holland) and OSA (Germany). Figural glow lights started to be imported into this country from Asia during the late 1960s. Bulbs stamped "Japan" on the base are of comparable quality to vintage American bulbs. Bulbs of more recent manufacture imported from China and Taiwan are of poor quality for the most part.